THE former French-Portuguese (dual nationality) banker António Campinos, the new President of the EPO, is rumoured to be planning layoffs; a hiring freeze at the EPO has already been implemented. What can his policies at EUIPO, from which he arrived exactly 3 weeks ago, teach us? In 2010 EUIPO awarded the contract for maintaining and developing its IT systems to a Spanish company UTE. The contract provided employment for about 150 people locally in Alicante. The contract with UTE was originally supposed to run for eight years, but in 2017 EUIPO’s IT maintenance services were put out to tender again because, according to reports in the Spanish press, the Director of EUIPO at the time, Mr. Antonio Campinos, wanted to conclude a new contract before he left EUIPO to take up his next job as head of the EPO in Munich. In November 2017 it was announced that the contract had been awarded to Sopra Steria, a multinational with corporate headquarters in France and worldwide operations including facilities in India which it intended to use for providing IT maintenance services to EUIPO. 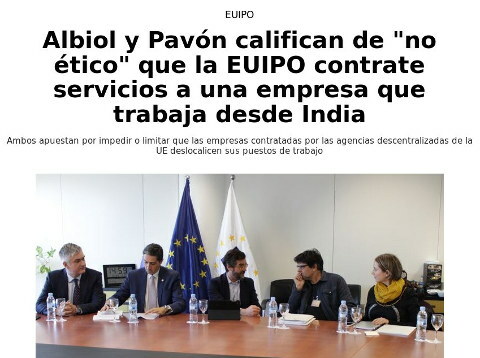 It was reported that EUIPO’s decision to outsource its IT maintenance services to India was likely to cause the loss of around 150 jobs in Alicante. The Spanish MEP Marina Albiol Guzmán criticised this decision in the European Parliament and submitted a written question to the European Commission in November 2017. The European Union Intellectual Property Office (EUIPO), one of the decentralised EU agencies, based in Alicante, recently awarded the contract for maintaining and developing its computer systems to Sopra Steria, a company that will provide its services from its facilities in India. With this decision, some 150 people who used to perform those duties in Alicante will lose their jobs. — Does the Commission consider the offshoring of services to outside the EU by European agencies proper? — Does this sort of decision help the decentralised EU agencies to achieve their goals, such as to ‘help make Europe more competitive and a better place to live and work, thus serving the interests of EU residents as a whole’? The vacuous answer given by Elzbieta Bieńkowska on behalf of the Commission stated that there was no reason to believe that the decision had violated the applicable procurement rules. The European Union Intellectual Property Office (EUIPO) is an agency with legal, administrative and financial autonomy, in accordance with Regulation (EU) 2017/1001 of the European Parliament and of the Council of 14 June 2017 on the European Union trade mark. This autonomy includes the power to award contracts for Information Technology (IT) projects, subject to the public procurement rules which apply to all EU institutions, including agencies. These rules do not provide the possibility for EUIPO to exclude tenderers on the basis of the geographical location of its staff. The Commission has no reasons to believe that the decision of the EUIPO to award the contract concerned to Sopra Steria (a company with headquarters in France) would have violated the public procurement rules. Criticism of the outsourcing decision and the predicted loss of 150 jobs in Alicante was expressed in the local and national press. The leading national daily El Mundo reported on the intervention of MEP Marina Albiol Guzmán in the European Parliament. Albiol Guzmán and Miguel Ángel Pavón, the leader of “Guanyar Alicant”, a local Alicante-based group linked to Podemos and the United Left, issued a statement criticising the decision and calling it “unethical” because it transferred work associated with the EU agency EUIPO “to countries where salaries are cheaper and labour legislation is less strict”. 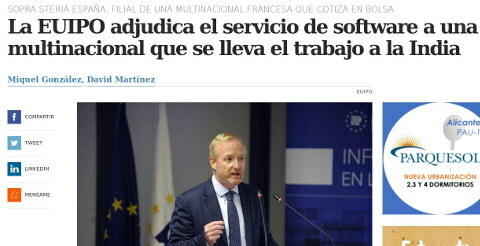 In December 2017, El Mundo reported that following Albiol Guzmán’s complaint to the European Parliament Campinos tried to justify the outsourcing decision with a blog post published on his personal EUIPO blog. However, after a number of comments critical of the decision were posted, he decided to block the posting of further comments claiming that the professionalism of EUIPO staff was being called into question. 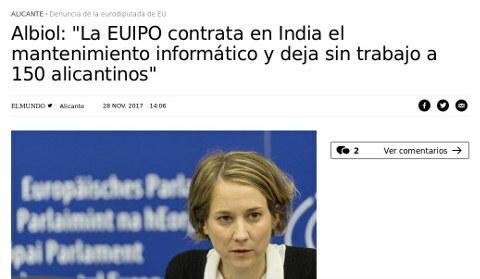 El director ejecutivo de la Oficina de Propiedad Intelectual de la Unión Europea (Euipo), el portugués Antonio Campinos, trató de dar explicaciones sobre la externalización de los servicios informáticos a la India en su blog personal «Time Out», al que tienen acceso tanto los trabajadores internos como los externos de la agencia. Lo hizo un día después de la denuncia de la eurodiputada Marina Albiol en la Parlamento Europeo con un post que llevaba por título «On Procurement and Outsourcing». Campinos aseguró que la decisión se basó en la mejor opción «calidad-precio» según un comité de evaluación y de acuerdo con la legislación europea. También aseguró que muchas empresas europeas externalizan sus servicios en un mercado global y que estas prácticas empresariales pueden contribuir a la creación de puestos de trabajo y riqueza en el interior de Europa. Desde primera hora de la mañana del día siguiente se publicaron comentarios a este post tanto de trabajadores de la Euipo (funcionarios europeos) como de trabajadores subcontratados e incluso miembros del comité de empresa. Los comentarios generalizados no ponían duda la legalidad de la externalización de los servicios de mantenimiento informático a otros países y continentes, como la India, pero sí la falta de ética de la decisión. Alguno le recordó que «no aprendemos del desastre de externalización» a la República de Mauricio hace 10 años. Otros hablaron de las elecciones sindicales en la oficina. Salió al paso uno de los miembros del «comité de personal» que en su segundo comentario aludió a estas situaciones, «que, aunque lamentables según un criterio de política social, son legales». No faltaron apelativos como el de «colonialismo del siglo XXI» o quienes explicaron que no tiene sentido a pedir que se registren las marcas en España y la UE cuando la misma oficina tiene un mantenimiento desde India. Incluso un comentario le recordó a Campinos que Alicante le hizo un «carril bici (no exento de críticas) pagado con los impuestos de muchos de los que hoy se quedan en la calle». 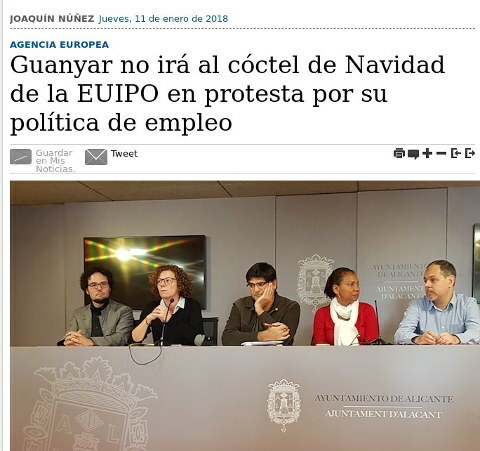 Tras 17 comentarios, Campinos cerró la posibilidad de publicar más apelando al respeto que merecen los trabajadores de la Euipo cuya profesionalidad se cuestionaba. Campinos said that the decision was based on the best “quality-price” option according to an evaluation committee and in accordance with European legislation. He also said that many European companies outsource their services to a global market and that these business practices can contribute to the creation of jobs and wealth within Europe. From early the next morning, comments to this blog post were submitted by EUIPO staff (EU officials) and subcontracters and even members of the staff committee. In general the comments did not question the legality of outsourcing IT maintenance services to other countries and continents, such as India, but rather the lack of ethics in the decision making. Some reminded him that “we have not learned from the outsourcing disaster” to the Republic of Mauritius 10 years ago. Others talked about the union elections in the office. One of the members of the staff committee spoke out and referred in a follow-on comment to these situations “which despite being regrettable from a social policy perspective, are legal”. There was no shortage of comments referring to “21st century colonialism” or arguing that there is little point in requesting trademarks to be registered in Spain and the EU when the same office has its IT maintenance carried out in India. One comment even reminded Campinos that Alicante had provided him with a “bicycle lane (not without criticism) paid for by the taxes of many of those who are now on the street”. 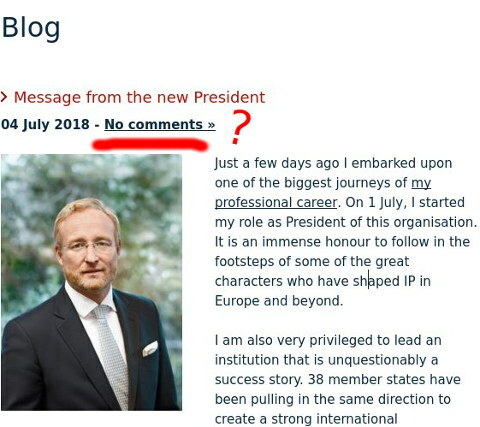 After 17 comments, Campinos disabled the publication of further comments, appealing to the respect deserved by EUIPO staff whose professionalism was being called into question. The USPTO Used to Pose a Threat to European Software Developers. Now It’s the EPO Posing a Threat to Software Developers Worldwide.